Joe McPherson poses with the 17-point buck he shot on Dec. 9 in Avoyelles Parish. Depending on how the official score shakes out, it could potentially be a new Louisiana state record typical buck. Since 1943, Don Broadway’s Madison Parish giant has stood atop the Louisiana Big Game Records as the state’s largest typical buck ever harvested with a gun, coming in with a score of 184 6/8 inches of sheer antler perfection. In the 75 long years since, thousands and thousands of hunters have ventured into the woods and marshes of the state and killed thousands and thousands and thousands of deer — and no one has beaten the Broadway buck (Ernest McCoy’s Bossier Parish deer came within a whisker in 1961, and claimed the No. 2 spot at 184 4/8 inches). Every couple of years a big buck is taken that get folks talking about a new potential record – Charlie Lusco’s big Diamond Island white-tail in 2016 netted out at 173 3/8 and came in at No. 24 on the all-time list. 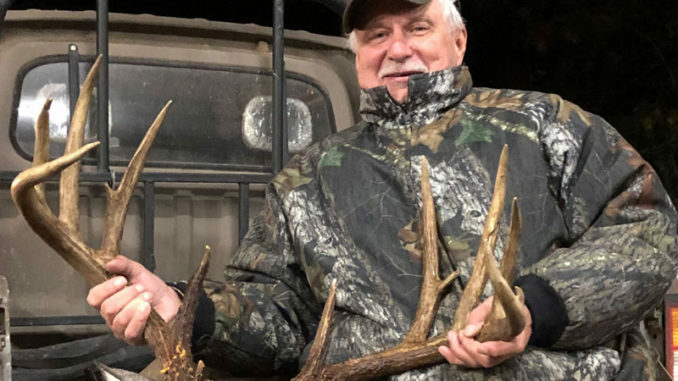 This season, potential typical state record rumors are swirling around a giant Avoyelles Parish 17-pointer killed by Joe McPherson last Sunday, Dec. 9, on the south farm of the old Louisiana Delta Plantation near Effie. Joe McPherson, of Woodworth, shot this giant 17-pointer in Avoyelles Parish on Dec. 9. 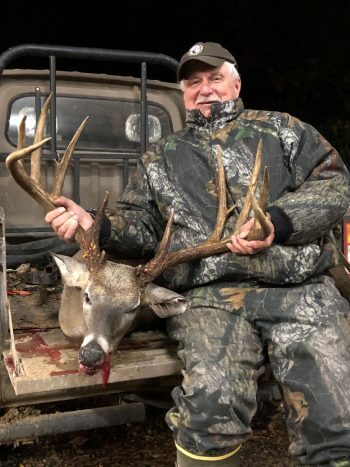 It has been green-scored from 196 to 203 inches, and could potentially be the new state record typical buck when it’s officially scored later this fall at the Louisiana Sportsman Show and Festival in Gonzales in March. The deer has been scored by McPherson’s taxidermist, and at Spotted Dog Sporting Goods in Columbia and Simmons’ Sporting Goods in Bastrop, with gross numbers ranging from 196 ⅛ at Simmons to about 200 by his taxidermist to 202 ⅜ at Spotted Dog. The deer was scored at 86 2/8 on each side at Simmons, and 83 ⅛ and 83 ⅜ at Spotted Dog. Main beams were 28 ⅛ and 27 ⅝, with bases right at 5 inches each. The buck weighed 223 pounds, and had an inside spread of 23 ⅞ inches, McPherson said. 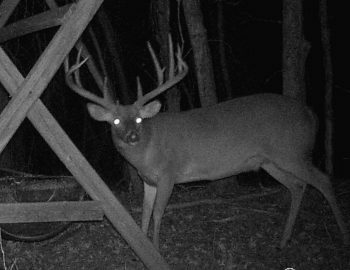 He hasn’t yet gotten a jawbone age on the buck, but is a bit concerned that it’s only 3 ½ years old, and perhaps might have been harvested a year too soon. “I actually would have liked to pass him again this year, and maybe if he turns out to be 4 ½ I’ll be real glad I shot him. But if he turns out to be 3 ½, it’s going to be bittersweet,” he said. “But I’m in an informal cooperative, and everybody else that I showed a picture of the deer to said they would shoot it if they saw it. McPherson said the buck was a symmetrical 10-pointer last season, with roughly a 20-inch spread that likely was in the 150- to 160-inch range. He didn’t know if the deer was still bedding down on his section of the lease this season until he checked his trail cams early last weekend. McPherson headed to his box stand overlooking an oak flat full of acorns Sunday afternoon around 3 p.m., and saw the big buck step out quartering from his right side about two hours later as the sun was about to set. He fired his 7 Mag from about 100 yards, and just like that, the big buck went down where it stood. McPherson is no stranger to big bucks: He has a non-typical mounted that’s never been officially scored that he suspects could top 200 inches. This buck will be displayed along with that one. “I’ve got a comfortable camp, and he’ll go on the wall with his brethren,” he said. This trail cam pic from Joe McPherson shows the 17-point Avoyelles Parish buck at a feeder. McPherson shot the giant on Dec. 9 on the south farm of the old Louisiana Delta Plantation near Effie. Now the waiting game begins for the 60-day drying period to pass, so an official Boone & Crockett score can be taken. 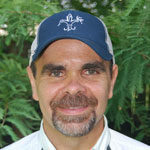 McPherson said his plan is to have the big buck scored at the Louisiana Sportsman Show and Festival at the Lamar-Dixon Expo Center in Gonzales March 14-17. In the meantime, the first rut is just about to kick off in Avoyelles Parish, and McPherson is heading back to his stand.